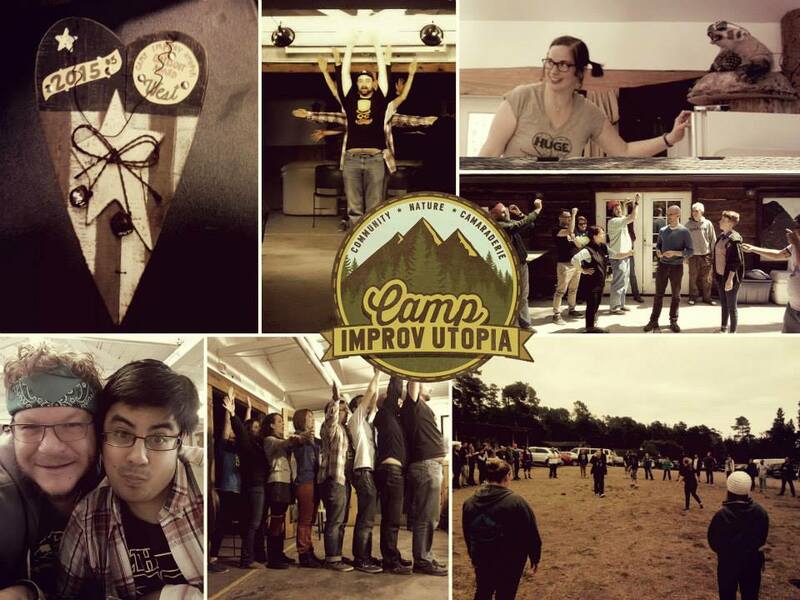 Over Memorial Day Weekend, I had the privilege and the honor to spend it with the wonderful people at ImprovUtopia in Cambria. I can safely say that it was one of the best weekends of my life. 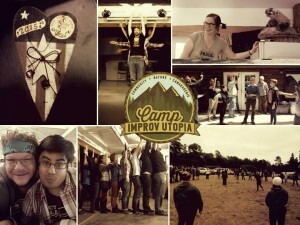 A weekend filled with improv workshops, camaraderie, and cabin rivalry. an opening ceremony where they called out all the troupes and theaters that were present at camp. (Roar Theatre represented) Shortly after the cabins took the time to meet each and plan for their cabin show on Sunday. I was in the Da Vinci cabin and while every other cabin was planning rivalry bits, the neutral Da Vinci was planning our awesome show opening. Shortly after, we all gathered in the main lodge to watch the teacher show. The teachers (Bob Dassie, Katie Nehsen, Drew Droege, Jason Pardo and Jill Bernard) were joined by Brian O’Connell and the founder, Nick Armstrong. They performed a hell of a set. We ended the night at the local watering hole, Mozzi’s, for drinks. Saturday started much like most improv classes start. With a warm-up. 70ish people gathered in a huge circle playing Thunderdome. I’m proud to say I lasted a good amount of time. After a good breakfast, we headed to our first class. Mine was with Jason Pardo and it was all about starting simple. Simple initiations. Based on the “Bring a Brick” theory. I loved it. I made some good friends during it. After that, we went to lunch. I think it was tacos. We had free time after lunch where we can do more camp-ish activities like archery and crafts. My cabin met up during that time and planned our camp show. I had Katie Nahsen’s class next. Her class was about relationship and emotion. We did this great exercise where we do bad initiations and start a relationship after that. I did some of my favorite scenes that class. My most memorable ones were my Harry Potter scene with Marianne Smith and my blind person scene with Charles Webber. After dinner, it was time for JAM CITY!!! That is where we got up and performed with each other. I was introduced to fun games like Amish Rake Fight. I did a terrible impersonation of Britney Spears and had no idea who Yogi Beara is, yet I had to roast him. Then, half of us went to Mozzi’s again and the rest were singing in a campfire singing songs. I was with the latter. Coffee nap!! After a late night at the campfire, I definitely slept in past the warm-up. After another delicious breakfast, I headed to my first class which was Bob Dassie from Dasariski. It was another great class. He gave really expert advice and notes. Shortly after class, we took a camp photo then headed to lunch. On our free time, the Da Vinci cabin got together and practiced our opening for the Cabin Mash-up. We took the song Fernando from Abba and changed the lyrics to improv terms and called it Leonardo. Then choreographed a dance to it. My last class was with Jill Bernard. And by god. She is fantastic. I love her. Her class makes you feel good about improv. She is the epitome of improv. Her personality is infectious. Just a wonderful person all together. (You should buy her awesome book too. Small Cute Book of Improv) After dinner we had the moment Da Vinci was working towards. The Cabin Mash-Up. I was excited to see everyone at camp perform. I was a little nervous because we had to memorize lyrics and sing during our opening while carrying Georgi. Our name finally got called up and we started. Drew and Sharon started singing the song while the rest danced. We all came in for the chorus After the chorus was over we got a huge applause. To their surprise we weren’t done. We had another verse and our final where we pick up Georgi in the air fly her on stage all while singing the last part. As we ending, we put her down and came into a half circle and sang the last line “If I had to the scene again, I would my friend, Leonardo.” Then we continued on to the improv set which ended in poop jokes. After all the cabins were done, the awards ceremony started. Da Vinci cabin ended up winning the “Balls Out” award. Shortly after, they had a surprise for Nick. Presents included a improv festival blanket, a troop leader hat and a heart warming video. I stayed out at Mozzi’s pretty late so it was super tough to get up the next morning. The energy was a little low around the site. Half of the reason is because we all stayed up late and got up early. The other reason is we knew camp was almost over. After I packed up. I said my goodbyes. Took a Da Vinci group photo. Then Danny, Sharon and I started our journey home. It was one of the best weekends of my life.